According to the World Health Organization, “adherence is defined as the extent to which a person's behavior, that involves, taking medication, following a diet, and/or executing lifestyle changes, corresponds with agreed recommendations from a health care provider.” It essentially refers to the degree to which a patient complies with a treatment regime. Another statistic that the WHO has published is that patient adherence in the case of chronic diseases is as low as 50% in developed countries while it is much lower in developing economies. Lack of patient adherence and compliance is a major concern for the pharmaceutical companies as it increases the potential need for a higher degree of treatment for patients. This is due to the fact that poor or lack of adherence results in poor health of the patient and in turn results in increased healthcare costs for the healthcare system. It is estimated that about 40% of revenue loss for major pharmaceutical companies is attributed to patient non-adherence and non-compliance. Pharmaceutical companies are investing significantly in order to develop effective solutions to address the growing problem of patient non-adherence and non-compliance. There are several factors that influence the adherence of patients. Some of these include patient related factors, therapy related factors, disease related factors, cost related factors, factors related to the healthcare system itself, and other socio-economic factors. Patient related factors include the attitude of the patient, the awareness level or lack of it, and misconceptions and perceptions about the disease and its treatment. Cost-related factors are one of the main factors as affordability is a major problem for those without health insurance and also in developing countries. In-house adherence support and Outsourced adherence support. 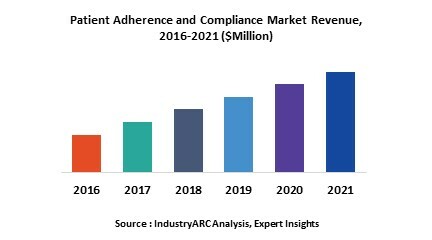 North America accounts for the largest share of the overall patient adherence and compliance market. This can be attributed to the developed healthcare system, increasing geriatric population coupled with the increasing cases of chronic illnesses that are prevalent in the region. 14.5. ProteUs Digital Health Inc.